After the Quilt Show I went back to the Fair grounds the next day to turn in the keys and pick up some boxes of old magazines that did not sell at the Flea Market to take to the recycle. There were also about a dozen garbage bags filled mostly with fabric that did not sell. These were set out for the Fairgrounds people to dispose of. But being the scrounger I am, I took about half of these bags to sort. I was curious to see what was left and what might still be useful. Maybe there are better ways to pre-sort our donations and give certain items away rather than taking up space in the Flea Market booth. In the course of my sorting I found these "pre-cut" pieces of raw silk. I thought I might play around with them. I decided to use them as is, just make squares and rectangles with the shapes available. I have not quite figured out the outer border. I might have to dip into my stash to finish it off. Not bad for a bunch of scraps that were headed for the land fill?! It's always a delight to see a Finish from a BOM that I had a hand in. It helps me feel like I'm doing something right! Lise did a fabulous job of arranging the blocks. 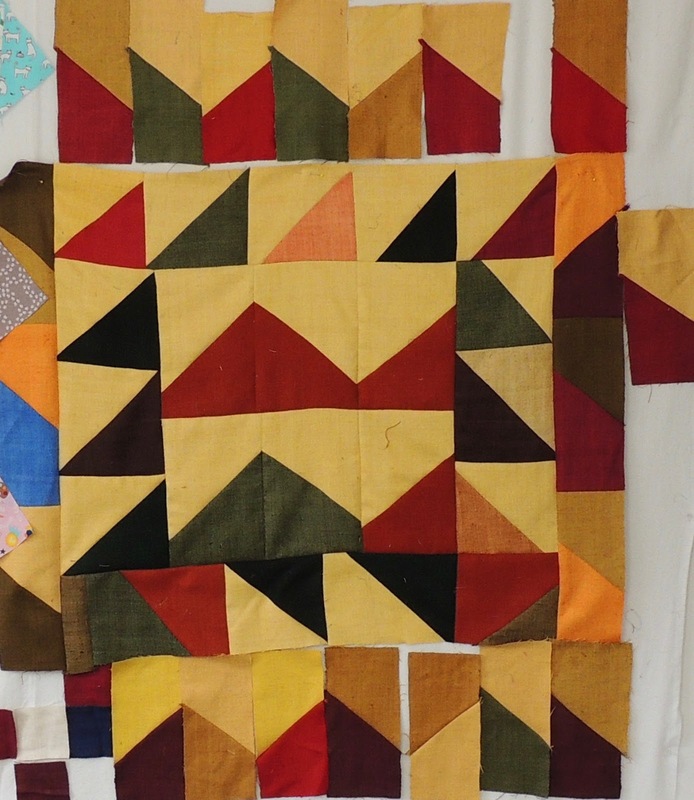 The colors and shadows dance around the top and make those scrappy blocks look so elegant! Brava, Lise! 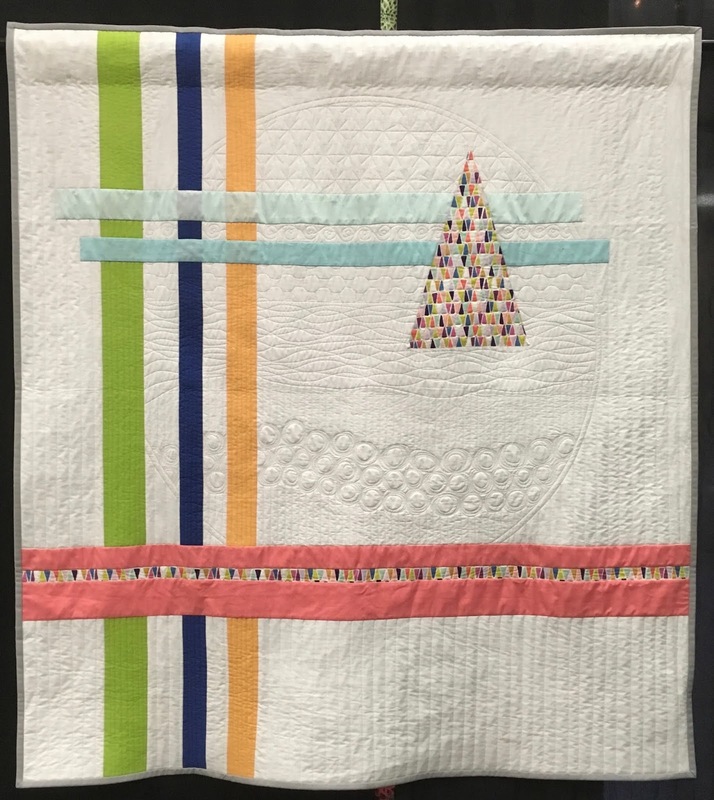 Here's another "Why Quilt's" Challenge. 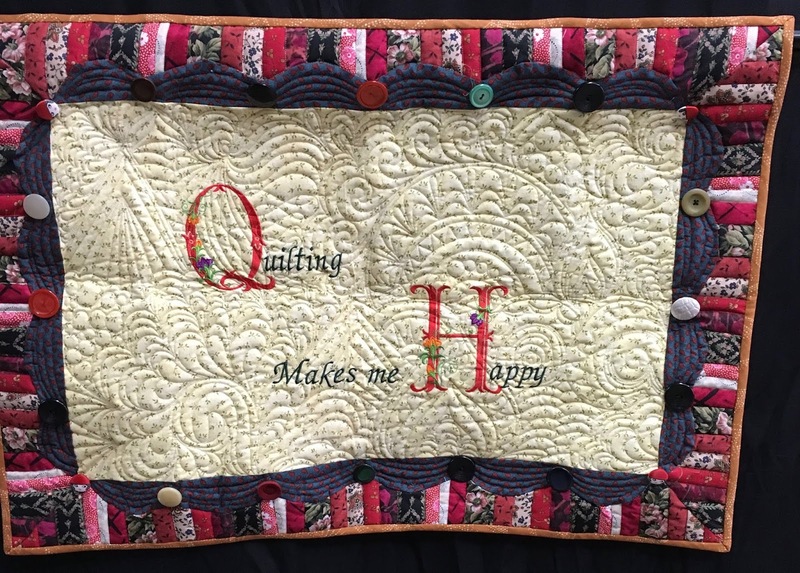 Quilting does make me Happy! Sorry I did not get the label on this one. 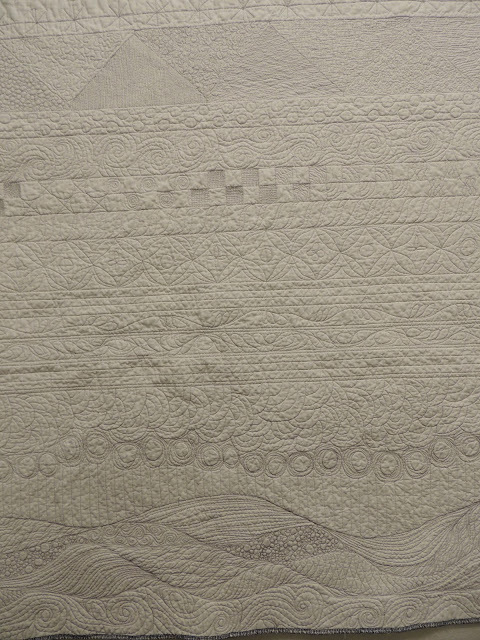 I really like the quilting too! This was my only submission besides the challenge quilt (see Feb. 25th post). 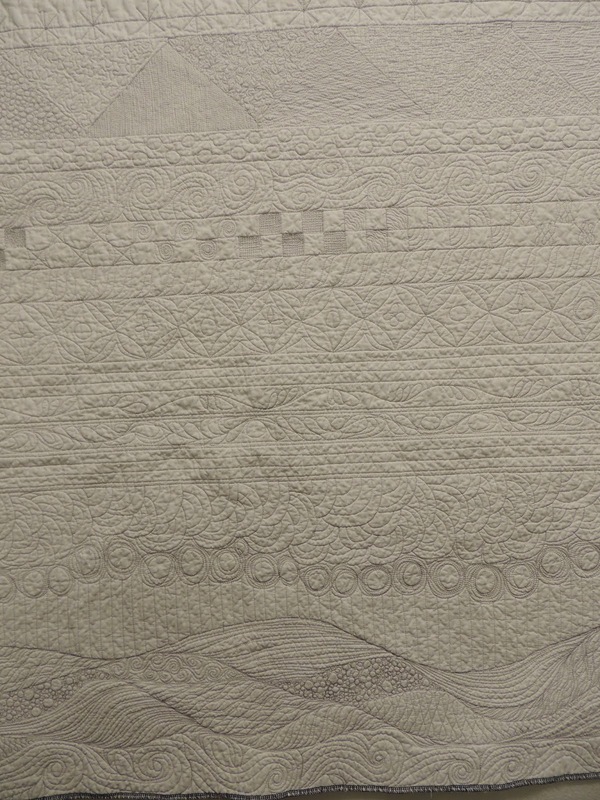 I really stretched myself on the quilting in this one. 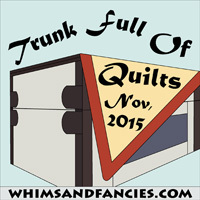 I actually spent many hours on Pinterest searching for quilting styles that I could manage. And then I made a sampler of all the patterns that I thought might work. Some of the stippling is ridiculously small. I got started filling in those triangles with small pebbles and then realized I was trapped in the land of the miniature and there was no where to go except finish the row in the same scale. It made me realize I don't spend nearly enough time practicing my quilting. I'm still pretty old school. I don't like super heavy quilting on my quilts. 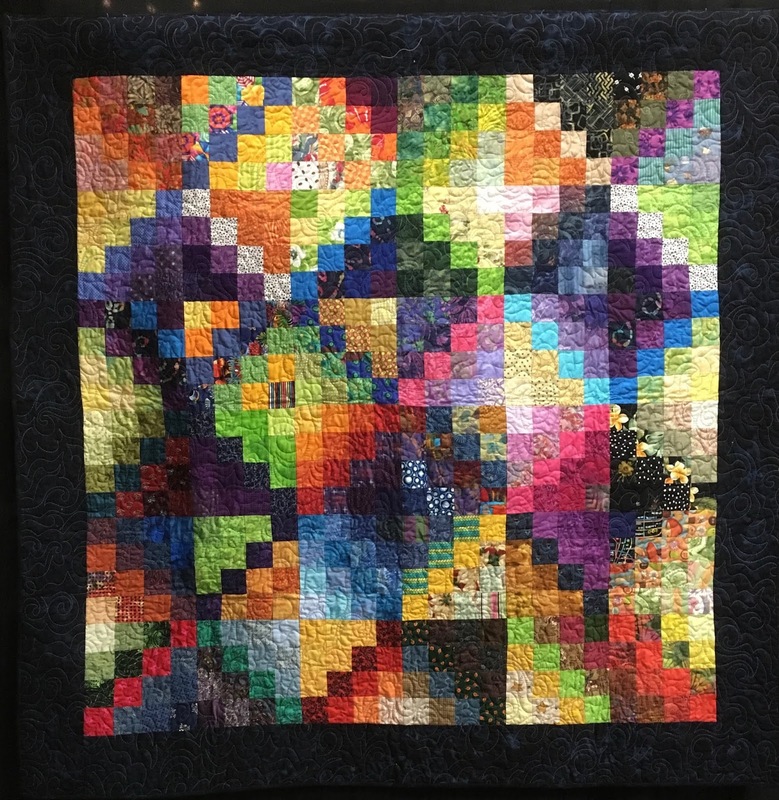 I admire the skill that it takes to produce it but my main goal is still to make quilts to be used and cuddled and I think sometimes the heavy quilting can detract from that. Oh, well, onward and outward. Always trying to find Balance. One of my dearest friends from college invited me to her daughter's is Baby Shower. Well of course I had to make a quilt! Claire did not want standard baby colors but she is a great lover of animals so I used that as a starting point to design her baby's quilt. But that just seemed toooo busy. I think I was working to hard at including as many animals as I could so I pared it down a little and repeated a few things and I think it was a little more together. 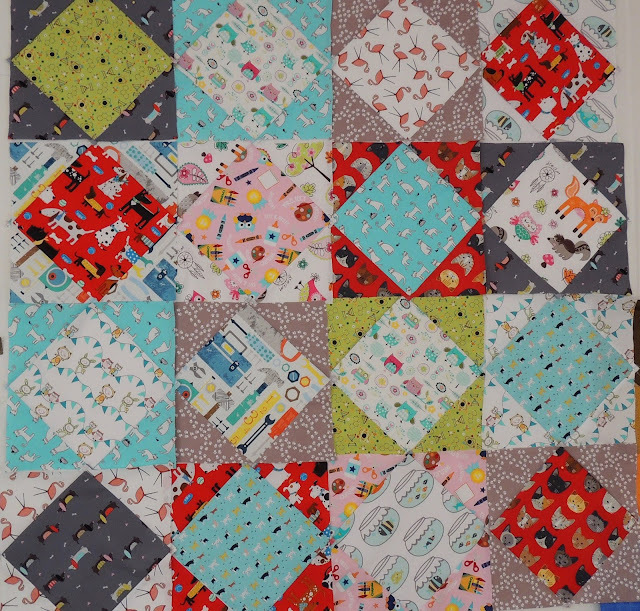 I spent a small fortune on these cute fabrics but now I have a lot left over for more kid quilts which will be fun! The cat fab had to go in the center since the mother to be has a cat. And some owl fabric, we all want our children to be wise! And since the new parents to be are both Lawyers there needed to be some nod to the importance of words and language and I actually had this cute flannel print in my stash! It's a nice switch-up from your standard quiche. The Salt portion reads" 1 tsp. 1 Tbsp but it should just be 1 tsp. of Salt which is sprinkled over the tomatoes. And bake at 450 degrees, check after 25 minutes. Last but not least, a little repair job. My son brought this quilt home for me to repair. It's a baseball quilt I made for him when he was in Little League, He was probably about 11 when I made it. He's 25 now so it's pretty old. Anyway he managed to poke a small hole in th black border. By some miracle I actually had a scrap of that fabric (and knew where to put my hands on it) and I was able to repair the hole. With a little wonder under and some invisible stitching you can hardly see the repair! If you zoom in you can see it. It's been a fun weekend! 'Hope yours was too!